Winning the Global Grind celebrity video correspondent contest! A few months ago a very close friend of mine approached me about a contest she found out about on twitter. She enthusiastically told me how she thought I would be perfect for the job and encouraged me to apply right away. I heeded her advice and applied a few days later hoping for the best. 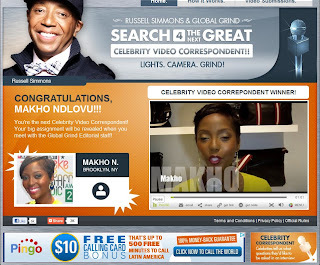 The contest was held by music mogul Russell Simmons and the mission was simple enough: to find the next great celebrity video correspondent. Right away something instinctively told me that this contest was right up my alley. Let's fast forward to Oct 31st. After tirelessly asking all my friends and family to vote for me, I waited with baited breath impatiently to find out if I had made the cut. At this point I knew I was in the final 5 and had submitted my video but after seeing all the other contestants I believed it could be anyone's game. On the night of Oct 31st, my phone rang and they informed me that I had won! I couldn't contain my excitement. I screamed, yelled and cried all at once. If you know me, then understand how much this means to me. To be handpicked by the man that discovered Run DMC, founded Def Jam Records and clothing label Phat Farm is in the words of Vice President Joe Biden " a big freakin deal" It's funny how when you put something out in the Universe with faith, hard work and dedication you realize anything is possible. I'm truly excited about this opportunity. Trust me when I tell you I didn't this alone. My support system of friends/family who voted for me, my friend Marshana who "beat my face" with the makeup brush, my homeboy Sekou at Simply Rides who shot and edited my video ..to you all I say THANK YOU. It truly takes a village. I thank God for this and I realize how lucky I am. I'm excited about this new journey and can't wait to share it with you! I will obviously keep you posted on all my activities so be sure to visit my blog or global grind to keep up. Thank you guys again and many blessings to you! Makho, it is always a pleasure "Beating" that face of yours with a Make-Up Brush. You're so beautiful, you're the best canvas...it makes what I do look even better, and oh so easy!! I'm so happy for you, so proud of you, and so blessed to have you in my life. Congratulations! May God continue to bless and keep you. Congrats...Use this opportunity not only to nurture and grow ya self but eventually be able to help others that you may no who are also hard workers pursue and find there dreams.